It was the summer of 2010 and we were travelling by car from Beirut to Damascus. The war had not started yet, and we couldn’t imagine then that it would. We were an unusual lot. George our driver, a typical Lebanese gentleman, me with a bright bandana and sneezing constantly due to the dust, Debbie in the seat behind me taking pictures and Shawna next to her, cursing the moment she agreed to come with us on this trip. The air conditioning had died and there was no choice but to roll down the windows, otherwise we would have been roasted alive. “It is now a mosque,” George mumbled. “It doesn’t matter. Because before it was a mosque, it was a church. And before it was a church it was a temple of Jupiter, and before it was…” Debbie started one of her historical lectures, but was cut short by Shawna. “Enough Debs. George how much longer?” she asked. “Maximum 45 minutes and we will be there. We have already entered the outskirts of Damascus.” George informed us. So, we all braced ourselves for our pilgrimage to the burial place of the sacred head of John the Baptist, or Nabi Yahya (AS). ‘Zechariah, we bring you the good news of the birth of a son whose name shall be John, one whose namesake We never created before.’ He said: ‘My Lord! How can I have a boy when my wife is barren and I have reached an extremely old age?’ He answered: ‘So shall it be.’ Your Lord says: ‘It is easy for Me’, and then added: ‘For beyond doubt, I created you earlier when you were nothing’ (Quran 19:7-9). “Zechariah exclaimed: ‘My Lord! How shall I have a son when old age has overtaken me and my wife is barren?’ He said: ‘Thus shall it be; Allah does what He wills'”(Quran 3:40). “And We bestowed favor upon Zechariah, when he cried to his Lord: ‘Lord! Leave me not solitary [without any issue]. You are the best Inheritor.’ So, we accepted his prayer and bestowed upon him John, and We made his wife fit (to bear a child). Verily they hastened in doing good works and called upon Us with longing and fear, and humbled themselves to Us” (Quran 21:89-90). “‘O John! Hold fast the Book with all your strength. We had bestowed wisdom upon him while he was still a child; and We also endowed him with tenderness and purity; and he was exceedingly pious and cherishing to his parents. Never was he insolent or rebellious. Peace be upon him, the day he was born, and the day he will die, and the day he will be raised up alive. (Quran 19: 12-15). 13 But the angel said to him, “Do not be afraid, Zechariah, for your prayer has been heard, and your wife Elizabeth will bear you a son; you will name him John. 14 Joy and gladness will come to you, and many will rejoice at his birth, 15 for he will be great in the sight of the Lord. He must never drink wine or strong drink, and he will be filled with the Holy Spirit, even before his birth. 16 He will turn many of the people of Israel to the Lord their God. 17 And he will go as forerunner before the Lord in the spirit and power of Elijah, to turn the hearts of the fathers back to their children and the disobedient to the wisdom of the just, to make ready for the Lord a people prepared for him” (Luke 1:13-17). “I tell you the truth, among those born of women, no one has arisen greater than John the Baptist. Yet the one who is least in the kingdom of heaven is greater than he is” (Mathew 11:11). There are many other references about John the Baptist including the details of how and when he baptized Jesus Christ in what is now River Jordan. I have put together information about John the Baptist from various historical and religious sources so forgive me if there is something you disagree with. Prophet John or Nabi Yahya (AS) was the son of Zechariah and Elizabeth. Elizabeth was Virgin Mary’s sister. Some traditions state that Mary and Elizabeth were cousins. Nevertheless, it is accepted by all that they were related. Zechariah was the caretaker of Mary. When he would visit his pious sister in law, and used to see heavenly food being sent to her, his heart pined for a pious off spring of his own. He asked his God to bless him with an inheritor. His prayers were answered and he and his wife were blessed with a beautiful baby boy. We are told that John from the very beginning was righteous, brave, respected and loved by all. The Roman emperor Herod was in power at that time, and countless atrocities were committed in his name. Prophet John was indeed an imposing figure with his staff, flowing hair and a clear and loud voice which spoke nothing but the truth. Tradition states that whenever he would hear of any injustice, he would rush to take the side of those who were wronged. Even the Emperor feared this holy man, as the Bible tells us. There are various accounts of why Herod ordered John the Baptist to be killed, so I will avoid the details. But he was indeed martyred and his head brought to Herod as proof of his martyrdom. 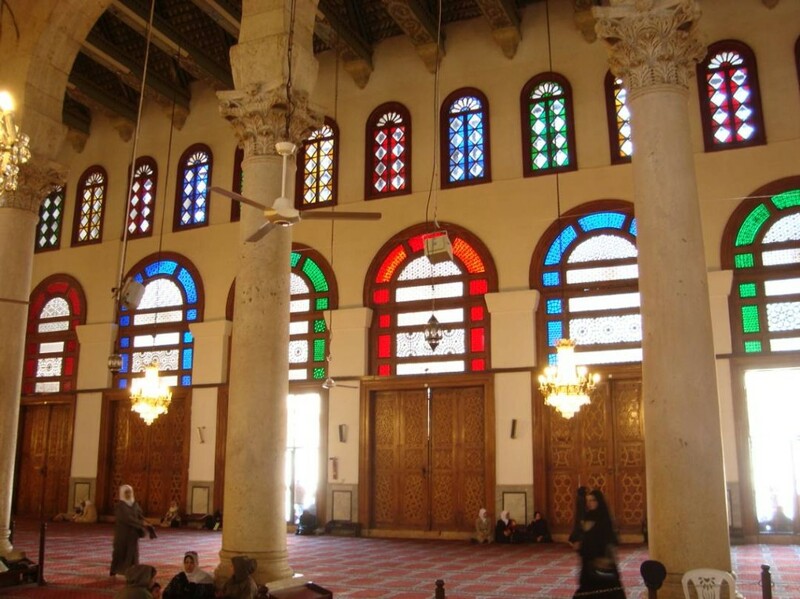 Even today, the pious head of this brave and righteous prophet is buried in an impressive domed structure in the heart of the Grand Mosque of Damascus. A place of reverence and pilgrimage for countless Christians and Muslims. Allah’s blessing upon the martyr, defender of the wronged, Prophet Yahya (AS), son of Zechariah. 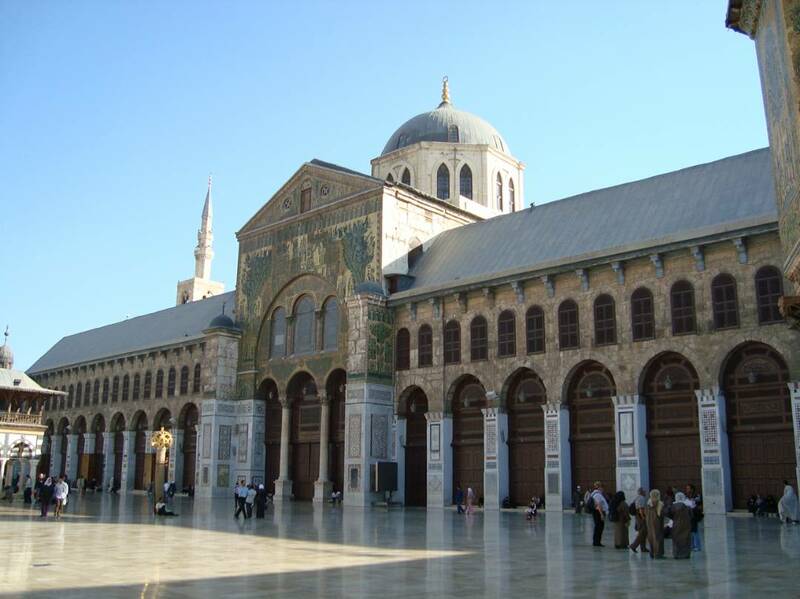 The Grand Mosque of Damascus or the Umayyad Mosque is built on a site considered sacred since millenniums. Historical records tell us that Arameans built a temple here for Hadad, the god of storms and lightening around 1000 BC. 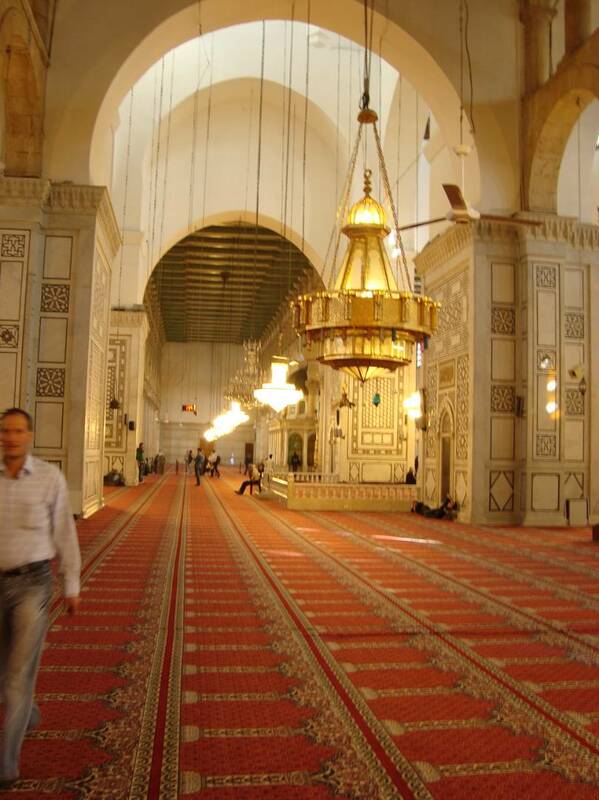 A structure bearing the image of a sphinx still exists in one corner of the mosque. In the early first century AD, the Romans built a temple to worship Jupiter over the Aramean temple. Some parts of the walls of this temple have survived. It was in the late 4th century AD that records show that the sprawling building was transformed into a church dedicated to John the Baptist. From then on there is mention of pilgrimages to the sacred site within the church where the head was buried, during the Byzantine era. Under the Umayyad caliph Al-Walid, the basic structure was demolished and the present mosque was built between 706 and 715 AD. But the domed structure said to contain the sacred head of John the Baptist was left untouched and continued to be a place of reverence and pilgrimage as it is today. There are many other important landmarks in and around this amazing mosque, like the tomb of Sultan Salah Uddin and the site where the head of Sayyadna Imam Hussein, grandson of Prophet Mohammad (peace be upon him) is buried. But they merit a separate article. 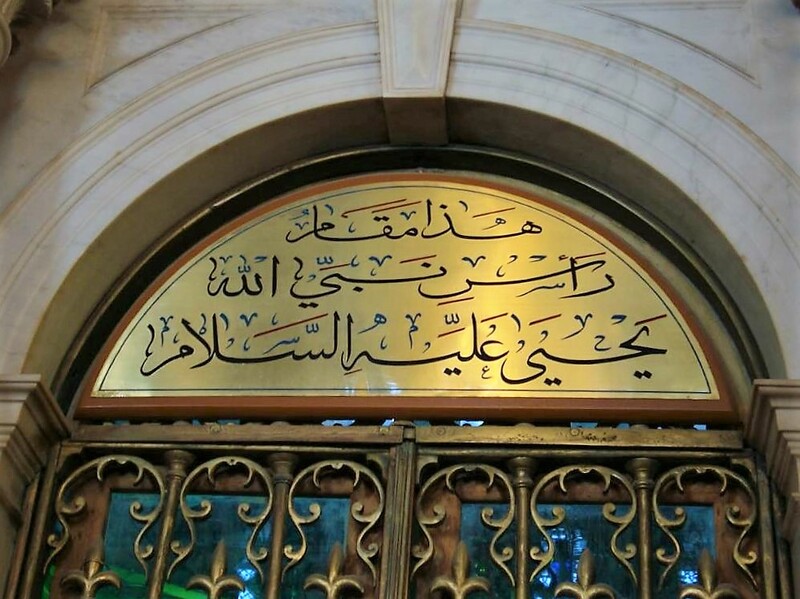 Where is Nabi Yahya (AS)buried? The rest of the body of Nabi Yahya/ John the Baptist is buried in a mosque near the Lebanese city of Saida. We had the fortune of having done this pilgrimage too. Many people in and around that mosque told us that even though countless centuries passed, blood kept seeping out of the grave. Later a structure was built to fully cover the grave because of this. Only God knows if this is true. All four of us stood in front of the beautiful structure along with other pilgrims. The women wearing hooded abayas to show respect for the mosque and of course the blessed head of the martyred Prophet of God buried there. We were as if in a trance, in awe, belittled by the holy presence. Suddenly tears started rolling down my cheeks. I tried to cover my face to avoid embarrassment, only to notice that everyone else was in the same state as me. For a moment in time, all of us, Muslims and Christians, became one in the love of this great man…and God. “Alhamdollilah”, I said as we walked out of the mosque. I had to thank my God for giving me this opportunity to be able to see this place with my own eyes. This piece was written by a staff contributor for The Link Canada. If you wish to know more about how you can contribute, please visit our "Contribute" page above. If you wish to join The Link Canada's official team, contact us at via the information on our contact page! Previous story #WasteFreeRamadan: A message, a mission.